The first Rengoku game was almost universally reviled. One hopes that when something like that happens, the developers take the many complaints under advisement when developing their sequel. (But really, how does such a game get a sequel?) Unfortunately, Rengoku II: The Stairway to H.E.A.V.E.N. defiantly marches out of the golden gates and commits, unabashedly, the exact same sins as its predecessor. The story is flashy and vague. This is epitomized in the opening cut-scene where two robots square off on a futuristic battlefield. Before anything actually happens though, film scenes from real wars are inter-cut. Why? Not sure. This scene ends without much explanation. It looks pretty, though. Ah, if only pretty cut-scenes made for interesting games. 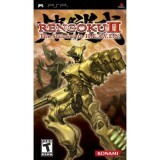 In Rengoku II: The Stairway to H.E.A.V.E.N, you control a war machine tasked with battling its way through a tower of similar robots to get to the top. You must go through one level at a time, clearing out the mini-bosses, sprinkled throughout the level, before being allowed to teleport to the boss. Once you defeat the boss you can advance to the next level. It is a sort of play on Dante\'s inferno with combat-itched robots. The battles are simplistic. The best strategy is to lock onto a target and strafe and fire. Over and over and over again. Even when you are forced to face multiple enemies at once this is still the best tactic. Just eliminate one at a time. The lock-on takes care of your aiming deficiencies and the strafing keeps the enemies confused and at bay. Rengoku isn\'t a tough game because of this but it isn\'t exactly easy either. The essential fortitude and power of robot foes greatly exceeds your own. Their speed, for example, is much greater than yours. Their power, too, is above the standard player-controlled variety. The only saving grace is that your health is constantly being replenished when you are not taking damage. So, momentarily high-tailing from the battle can put you right back in the fight. Rengoku feels like it needs to be played with dual arcade sticks instead of the directional pad. This is, in part, because the robot controls like a sumo wrestler with rockets strapped to his armpits. The robot looks, dashes, and runs with the D-pad or the analog stick alone, making precise control of your robot extremely difficult. If you are off by even a fraction, even when the \"press x button\" indicator is on screen, you will be unable to access doors and teleporters. This is extremely frustrating because tapping forward, backward, left or right, will cause the robot to dash, inadvertently, in the given direction. So every time I found myself out of reach of a door, I ended up dashing away when I tried to overcorrect. Many times I was forced to backtrack, reposition, and run forward, for the effect of stopping at a more precise, door-accessible, position. There are some things I enjoyed about Rengoku II. In fact, for a brief time I started getting a little soft spot in my heart for ol\' Ren. There are a ton of weapons and upgrades you can earn. And customizing my robot was definitely my favorite part of the game. Adding weapons is reflected by the look of your robot as well. Adding a gun to the head changes its shape. So you even get to customize the look of your robot to a degree. The variety of weapons is also impressive. There are shields, missile launchers, various guns, chainsaws, and blades, to name a few. You can customize your arms, legs, head, and torso. My robot, for means of illustration, had a giant gun-barrel coming out of his mid-section. I like the music in Rengoku, too. Often reviewers mention that the music is good as consolation for the numerous other vices. But the music is actually catchy. Sometimes it was a little bit like the matrix soundtrack. Other times it reminded me of some of the better music from a good anime. More epic than bubblegum pop. Unfortunately, because the levels take far too long to complete, the music gets repeated more than is necessary. The graphics are not too shabby, either. During actual gameplay they tend to get kind of lost in the fray of robot combat. But both the graphics and the art style are easily worth mentioning. Manga artist Jun Suemi created some interesting inhabitants for his robo-hell. It\'s just too bad that you only really get to appreciate them in brief close ups. A couple of the battle locations are cool, too. I personally liked the terminal, where you equip your upgrades. Which opens up to expose spindly spider arms that bring you into the customization screen. The rest of the level design isn\'t as sharp as the early impressions. The level design is Rengoku II\'s biggest failure. Each room is so very similar and, at times, seem endless. I spent most of my effort with Rengoku II wandering around the levels aimlessly. The map is mostly useless. The only thing the map does is indicate which doors you have and have not passed through, making it a test of \"where haven\'t I been?\". The map only shows the room that you are in, so thinking ahead isn\'t in the cards. Also, it\'s easy to tell what door you haven\'t been through without the aid of the map. The map also shows you where in the room the enemy is, but you can see that for yourself most of the time also. After a while the rooms, even the levels, start to blend together. You are given no guide with which to get your bearings. It didn\'t take much wandering around before I wanted to say \"forget you!\" to Rengoku II. In the beginning I wanted to give Rengoku the benefit of the doubt, let it redeem itself. The poor level design, however, killed that. Every time you die, all your equipped weapons fall to the battlefield and you are transported to the bottom floor of the tower. Your only option is to equip your other, less effective weapons and battle back through the level to retrieve them. To top it all off, reequipping the good weapons mid-level is impossible. And you are forced to retreat to the beginning of the level to do that. Rengoku II supports up to 4 players in wireless battle - off of a single UMD no less. It\'s a very attractive feature, but I just can\'t see very many people playing against their friends for extended periods of time, even for repeat battles. There just isn\'t enough depth to the battle system to warrant such a commitment. The win often goes to the luckiest gamer (who cherry-picks from afar) or the one with the best robot rather than the best pilot. The story in Rengoku II is almost non-existent, and as incoherent as the controls. The level design is some of the worst I can honestly remember. Not giving a decent guide to get the player through the levels is inexcusable. Still, I did grab a few moments of enjoyment from it. I can\'t really recommend Rengoku II, because it\'s just not that good, but I\'m not about to hold it up as an example of the worst that gaming has to offer. Still, I guess that\'s not much to brag about.